Ed Begley Jr., born on September 16, 1949, is known equally for two things—being a great actor and being a great environmentalist. He is just as well known for his Emmy nominations as for riding a bicycle to the Oscars. His father was also an actor, and Begley followed in his footsteps, working his way up from cameraman and stand-up comic. “I’m not a wealthy person,” he said, “because I was never a star. I was a working actor and a supporting actor.” He has appeared in more than 100 movies and countless television programs, along with a featured role in the hit series St. Elsewhere, from 1982-1988. His environmental work is as impressive as his acting work. Begley got turned on to the environment at the first Earth Day, in 1970. Since then, he has worked continuously to drive his ecological footprint smaller and smaller. “All this stuff was very cheap. So I stayed with it. And it’s been a series of continuous discoveries ever since.” He lives now in a LEED-certified platinum home in southern California. The home—and his electric car—is powered almost entirely by solar panels. The walls are extra-thick to provide insulation. He has two drainage systems for water, allowing “gray” water to be diverted into a 10,000-gallon cistern used to irrigate a fruit orchard. He still uses a stationary bicycle with a generator attached to create electricity—enough in a 15-minute work-out to make his morning toast. He has been recognized many times for his environmental stewardship and example, including by the California League of Conservation Voters and the Natural Resources Defense Council. In 2009, he was inducted into the National Environmental Hall of Fame. He has served on the boards of many environmental organizations, including the Santa Monica Mountain Conservancy. He was named to the Los Angeles Environmental Affairs Commission in 1993, but later quit because they killed too many trees by wasting paper. He was an early opponent of the Keystone XL pipeline. Begley Living. About Ed. Available at: https://begleyliving.com/the-begleys/ed-begley-jr/about-ed/. Accessed September 15, 2017. Colby, Anne. 2014. Eco-conscious Ed Begley Jr. lives by example. Los Angeles Times, April 21, 2014. Available at: http://www.latimes.com/home/la-hm-ed-begley-jr-20140419-story.html. Accessed September 15, 2017. Internet Movie Database. 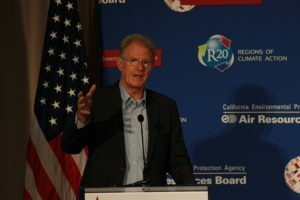 Ed Begley Jr. Biography. Available at: http://www.imdb.com/name/nm0000893/bio?ref_=nm_ov_bio_sm. Accessed September 15, 2017. National Environmental Hall of Fame. 2009. Ed Begley, Jr. Inducted into National Environmental hall of Fame. Available at: http://edbegleyevent.blogspot.com/. Accessed September 15, 2017.